The campsite Europe has the advantage of being quiet and being close to everything. A few steps from the beach, bustling area with a variety of shops, to please all. Go shopping, have a drink or an ice cream as you stroll through the "Allée des Pins". Lie on the beach, party in the bars at night, attend outdoor concerts ... or opt for the tranquility of the campsite, leisurely play petanque , have an aperitif with friends, or even take part if you want? - Join spontaneous gatherings like an evening around a guitar ... That’s the freedom of holidays ! In the campsite EUROPE, a good atmosphere and fun are guaranteed! 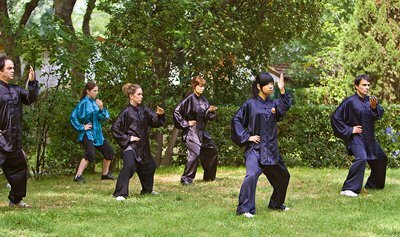 From April to June, you can do Tai Chi Chuan, with one of the best professionals, Chen Xuejiao. Suitable for all, this discipline can improve the physical and mental wellbeing. This martial art involves the principles of traditional Chinese medicine.